Search.nariabox.com – How to remove? Search.nariabox.com falls into the category of browser hijackers that can change your browser preferences without your approval. Its main purpose is to boost web traffic, which is why it will cause other disruptions as well. The hijacker will inject commercial data into the pages that you visit, track your cookies, cause redirects, and more. There is nothing beneficial about keeping it installed. If you want to go back to your original browser settings and eliminate other unwanted symptoms, you will have to terminate Search.nariabox.com. Search.nariabox.com works in a similar manner to Search.installmac.com, Search.maksmack.com, Search.myppes.com, and other hijackers that belong to this group. They are aimed at Mac computer users. Once in the system, the hijacker alters your settings replacing your home page and default search engine with Search.nariabox.com. This page presents you with a search box and such search parameters as Web, Images, Videos, and others. If you make use of it, you will see results from Genieo Yahoo Web Search. You should keep in mind that they will contain sponsored ads and links. Unfortunately, the advertising data will not be limited to one page. You will see pop-ups, banners, coupons, and other ads on all of your visited pages regardless of their content. Some of them will be based on your browsing history as the hijacker collects information about what pages you visit, what you search for, and so on. It is important that you know that not all of the ads that are shown to you can be trusted. The hijacker does not differentiate between fake and legitimate adverts. It shows you both kinds and does not hold any responsibility for what happens after you click on them. You could be rerouted to unsafe websites, where you could unwittingly infect your PC, waste your money, or suffer other consequences of dealing with virtual scams. In addition to lowering your online security level, the hijacker also slows down your browsing speed. There is no reason for you to tolerate any of these inconveniences. We advise that you delete Search.nariabox.com as soon as you can. 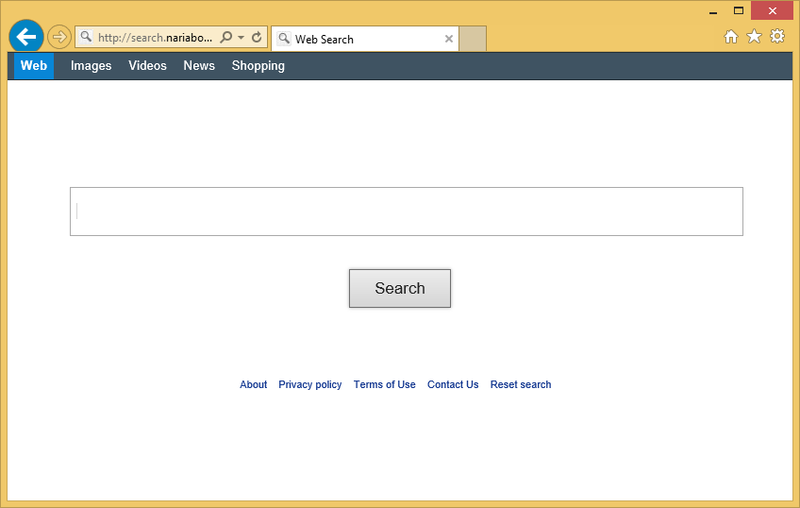 In order to eliminate Search.nariabox.com from your browsers, you will have to uninstall its associated program from your PC and restore your browser settings. You can do that manually or automatically. Manual Search.nariabox.com removal instructions are presented below this article and you can use them, should you choose to go with the first option. The more reliable solution, however, would be to erase Search.nariabox.com automatically. If you download a malware remover from our site, it will scan your system and detect all unwanted files and apps that are stored on it. The security tool will not only help you get rid of Search.nariabox.com, but it will also safeguard your computer from future online infections.